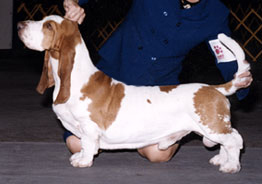 Below are the titled Bassets who were or are owned or bred by Claudia at Topsfield. Click on any photo to see the pedigree. The below dogs have attained the title of ROM. 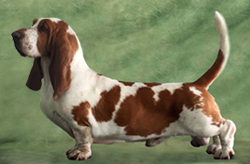 The Register of Merit is a listing sponsored by the Basset Hound Club of America for top producing Basset Hound Sires and Dams. These dogs have completed both their Championships, both in the Conformation Ring and at the Field Trials as well. Jimmy Choo was bred by Claudia Orlandi, Claire Steidel, Anne Testoni & Bjorn Zetterlund. Our thanks and congratulations to his owner Denise Rushworth for doing so well with him in the Performance Events. 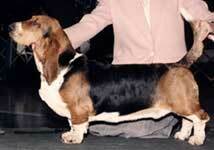 Jack was bred by Gail Allen & Gillen Tankard. Our appreciation to both Gail & Gilley for sharing Jack with us here at Topsfield. It was a great joy to have him here with us. Lovey was bred by Nancy Richmond, Lisa Brackett, Anne Testoni & Bjorn Zetterlund. She was co-owned by Claudia with Nancy, Lisa and Anne for most of her career. Fielder is Lovey's son, and was bred by Nancy Richmond, Lisa Brackett, Anne Testoni and Claudia Orlandi. Fielder was sired by CH Cloverhill-Topsfield Cable Cars, ROM. Field Champions must have earned 2 first place finishes against at least 6 dogs in competition and a total of 60 points with at least six other placements in their field trial class. Buster was bred by Mary Getman, Nancy Richmond, Claudia Orlandi & Anne Testoni. He is owned by Nancy Richmond and Mary Getman who deserve the credit for Buster's success. Bitsy was bred by Nancy Richmond, Denise Rushworth, Belinda Lanphear & Judy Tuck. She is owned by Nancy Richmond, Claudia Orlandi & Guillermo Gonzalez. 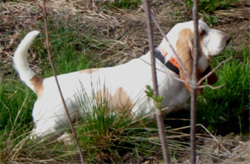 Hounds are judged on their hunting potential. It is not a competition against each other. Them may perform as a solo, brace or two-couple pack. Three passing scores in either solo only, brace only or two-couple pack only, earn certificates. HH is Hunting Hound, SHH is Senior Hunting Hound, MHH is Master Hunting Hound, and MHE is Master Hunting Hound Excellent.